Citation: C N Trueman "Henry VIII and Foreign Policy"
Henry VIII’s foreign policy primarily involved France and the Habsburg Empire. Traditionally, Tudor foreign policy tried to steer a path of neutrality with both these states and initially Henry VIII’s foreign policy was no different. Henry knew that England did not have the ability to take on either state but that as a nation she could profit from extending the hand of friendship to both. This plan fell apart when it became plain that Henry wanted to divorce Catherine of Aragon. Charles V would not contemplate any form of association with Henry VIII – as Catherine was his aunt. 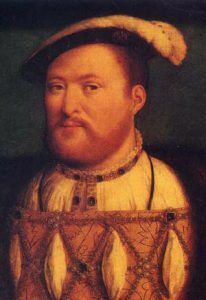 Charles believed that Henry VIII was depriving Catherine of all honour, something he was not willing to tolerate. However, Henry was astute enough to know that the position of Charles V in mainland Europe was such that he could not do anything about Catherine’s plight in England. Charles had far too much to think about with the Turks on the southeast of his empire to be able to help his aunt. However, he made clear his displeasure at the way Catherine had been treated. Francis I of France tried to take advantage of this breakdown between Henry and Charles. He gave tacit support to Henry’s call for the Pope to nullify his marriage to Catherine. As a result both men met in great splendour at Calais in October 1532, where Francis greeted Anne Boleyn as if she was queen. Francis planned to help Henry further. In October 1533, Francis was due to sign a treaty with Pope Clement VII, which Francis hoped would include some settlement to Henry’s problem. Francis was not being altruistic – he simply wanted to create a powerful bloc against the Habsburgs. Henry ended this try by Francis when he made it plain that he planned to resolve the issue by himself. Henry himself had to play a delicate diplomatic game. He knew with a degree of certainty that Francis was only ‘befriending’ him as part of an alliance against Charles V. The last thing Henry wanted was to become involved in a war between France and the Habsburgs – yet he did not want to antagonise Francis. The geographic distance between Vienna and England was sufficient to convince Henry that England was safe from Charles V. However, France was a different matter. When Francis made discreet overtures about marriage between his son and either Mary or Elizabeth, Henry failed to respond. He simply did not want to become embroiled in France politics. Francis and Charles concentrated on one another after the death of Francesco Sforza, Duke of Milan, in 1535. Both concentrated their efforts on who should succeed him – thus leaving Henry with a degree of freedom with regards to his foreign policy. He pursued his desired for policy of neutrality. English diplomats in France were told to keep relations with Francis “cold”. Henry could play this policy while Charles and Francis directed their foreign policies at one another. The one thing that Henry feared was an alliance between the two. Such an alliance seemed a distinct possibility by 1538. Charles and Francis met at Aigues Mortes in July 1538 in the presence of Pope Paul III. To Henry it appeared as if the major Catholic powers of Europe were pooling their power. On paper, Henry was in a weak position against such united powerful opponents and he tried to break up the Habsburg-Valois entente – he even offered himself for marriage to various French princesses but this came to nothing. In November 1538 Henry involved himself in negotiations for marriage to the niece of Charles V – but this too came to nothing. His position in a Catholic dominated Europe became even weaker when in December 1538 a papal order was dispatched supporting the deposing of Henry. The papal order called Henry “the most cruel and abominable tyrant”. This order made Henry fair game to any Catholic. In response to this threat – a threat Henry took very seriously – Henry did a great deal to develop the navy. In 1539, Marillac, the French ambassador in England, wrote of 120 naval ships being based in the mouth of the Thames and 30 in Portsmouth – a considerable increase on the five ships he inherited from Henry VII. Henry ordered the modernisation of all coastal defences on the south coast – much of the material needed for repairs came from nearby monasteries. One way that Henry countered this threat was to court the Lutheran princes of North Germany. On paper, they would not have been able to counter the military might of a combined French-Habsburg attack but they held a strategic position in Europe that could have inconvenienced the emperor. In January 1539, talks were held with the Schmalkaldic League but they got bogged down in theological arguments and came to nothing. In July 1539, Henry received the agreement of William of Cleves for his sister, Anne, to marry Henry. William was a Catholic in the same mould as Henry and needed an ally of some standing as his position in Europe was threatened by Roman Catholics loyal to the Pope – men such as Francis I and Charles V. On January 6th 1540, Henry married Anne at Greenwich. Francis had allowed Charles to march across his lands in December 1539 to facilitate the putting down of a rebellion in Ghent – the co-operation between the two was a clear worry to Henry. Charles put down the Ghent rebellion but it did not usher in an era of more co-operation between the two, much to the relief of Charles. Henry’s ability to maintain a degree of separation from Europe relied, to a great extent, on the fact the Charles and Francis were to all intents, enemies. Any reconciliation was invariably followed by conflict – and this meant that their attention was concentrated on themselves. The 1539 agreement between Charles and Francis was followed in July 1541 by war between the two. Henry could only benefit from this. In February 1543, Henry allied with Charles. They agreed on upholding ancient trade agreements and guaranteeing the other against invasion. They also agreed that there would be a major attack on France within two years. In particular, Henry wanted to gain Boulogne. Henry committed 5,000 troops to an attack on France. On September 14th 1544, Boulogne surrendered to the English and Henry seemed to be on the ascendancy with regards to his position with Francis. However, on September 18th, Charles deserted Henry and made his own peace arrangements with Francis. 1545 was a year of crisis for Henry. Many expected a French attack and in July 1544 a French force landed at Bembridge on the Isle of Wight. The fleet also intended a landing at Seaford but disease put paid to this. The one saving grace for Henry was that Francis was not in a strong position and he sued for peace. He granted Henry Boulogne for eight years and agreed to pay Henry a pension of 95,000 crowns for the duration of Henry’s lifetime.